As a war correspondent, Wilbur Fisk was an amateur, yet his letters to the Montpelier Green Mountain Freeman comprise one of the finest collections of Civil War letters in existence. "Literary gems," historian Herman Hattaway calls them. "It would be believable that some expert novelist had created them." But Fisk was no novelist. He was a rural school teacher from Vermont, primarily self-educated, who enlisted in the Union Army simply because he believed he would regret it later if he didn't. Unlike professional war correspondents, Private Fisk had no access to rank or headquarters. Instead, he wrote of life as a private—as one of the foot soldiers who slept in the mud and obeyed orders no matter how incomprehensible. "As for the plans our superiors are laying out for us to execute," he wrote, "we know as little as a horse knows of his driver." Between December 11, 1861 and July 26, 1865, Fisk wrote nearly 100 letters from the battlefield to the Green Mountain Freeman, all of them signed "Anti-Rebel." At the beginning of the war he was exuberant and eager for contact with the enemy. In his first letter he boasted, "This regiment would relish a fight now extremely well." Two years later, after the battle of Gettysburg, Fisk was disillusioned and war weary. "The rebel dead and ours lay thickly together, their thirst for blood forever quenched. Their bodies were swollen, black, and hideously unnatural. Their eyes glared from their sockets, their tongues protruded from their mouths, and in almost every case, clots of blood and mangled flesh showed how they had died, and rendered a sight ghastly beyond description. I thought I had become hardened to almost anything, but I cannot say I ever wish to see another sight like that I saw on the battlefield of Gettysburg." 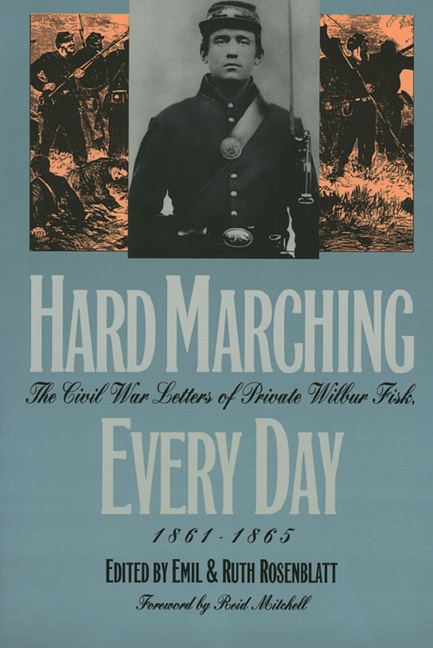 Fisk wrote as eloquently on the moral and political issues behind the war as he did on the everyday hardships of life in the Army of the Potomac. He saw the war as a question of right and wrong—of freedom against slavery and democracy against aristocracy—and he continued to believe that the war had to be fought, even after he was well acquainted with its horror and pointlessness. "When they have done their killing, there remains the question to be settled the same as before. They might as well have settled it before the shooting as afterwards." In this volume editors Ruth and Emil Rosenblatt have included all of Fisk's existing letters to the Freeman, along with three speeches from the 1890s in which Fisk looks back on his wartime experiences from the vantage point of an older man.